Design Lead @ SEEK Ltd.
Our goal is to help people live more fulfilling and productive working lives and to help organisations succeed. We do this by matching the best talent with the best job. I work across SEEK Employment and SEEK Business. I try to blog about my work to act as a portfolio. Apparel21 makes fashion for the software industry, primarily an ERP, also called Apparel21, and supporting products: POS (point of sale) System, web-based Mailer app and mobile optimised Stock Finder app. For the development of an app as part of my thesis research I was the only UXer on the team. I facilitated design and research, with other members of the team contributing. As anyone in tech knows, family will always ask you for help when their computer breaks. When you're a UXer you get that too (especially since older members of the family often don't understand what you do other than "work with computers") but you also get everyone's idea for an app asking for UX advice. The UX doctor - show me an interface and I'll diagnose what's wrong with it when they can't put their finger on why it doesn't look right. Of course, I always say that I don't know the best advice, we need to talk to the intended users to know that, but I enjoy providing the quick fixes that make the interface look "right". Affinity mapping is the easiest way to deal with large amounts of qualitative data and see the patterns that are emerging . I like to make the complex, simple. My thesis research involved displaying complex messages, simply, with visual statistics. I enjoyed thinking outside the post-it note and coming up with multiple ways to present this information, and, of course, testing this with users to ensure that they understood what the visuals are trying to communicate. I have experience conducting workshops with various stakeholders and end users to understand varying needs. I am a huge advocate of the benefits of wireframes and prototypes. Words often fail when trying to describe design vision, so I communicate using the best fidelity for the purpose: a sketch on the whiteboard; a scribble using my handy sharpie; low fidelity wireframes; or pixel perfect. I have used personas in both academic and industry contexts. I introduced personas to Apparel21 after findings broad ideas of the user were not helping us design for them. Personas were created from aggregated discussions and observations with real users. Besides my normal day-to-day UX research - usability testing, qualitative and quantitative analysis, concept validation etc - I have published research as part of my Masters (completed) and PhD (in progress). It is known that researchers, artists and hobbyists have augmented their bodies in new ways by voluntarily inserting non-medical devices. However, what devices are being used for and why insertable was the mode selected, are not well documented. Prior work documents single case studies or individual participant use. There is a research gap to understand what people are inserting into themselves voluntarily and why? This knowledge will inform future use and design and position insertables as a device mode of choice for users and a legitimate category for hardware manufactures, HCI researchers and interaction designers alike. Smartphone devices have become ubiquitous, and with this e-health apps common. However, the efficacies of available e-health apps vary greatly due to lack of behavioural change theory, scientific foundations and healthcare professional involvement in development. 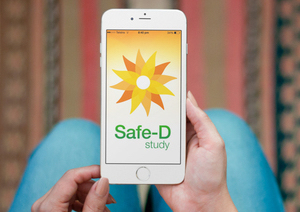 My masters research leveraged the Safe-D case study to develop an app, also named Safe-D, to improve vitamin D status in young women, safely, through persuading UV exposure. 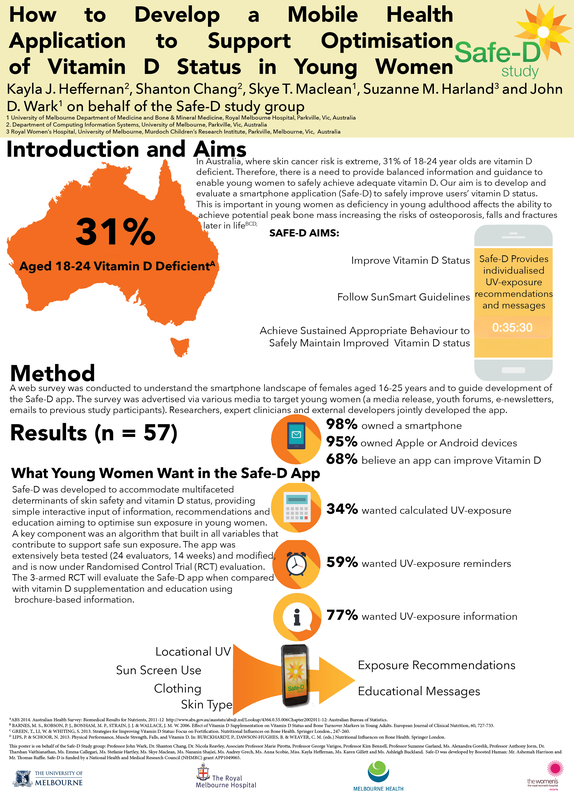 This poster was presented at ANZBMS 2014 (Australia & New Zealand Bone & Mineral Society 2014 Annual Scientific Meeting) to visually explain our research undertaken prior to beginning the development of the Safe-D application. A theoretical set of apps designed for e-health software and applications project. Presentations on Insertables and my PhD work can be found on the Insertables Page. When I'm not busy working or studying, I can be found presenting. If you want me to talk at your event get in contact.